We got the BEST news today!! I think we are beaming ear to ear! Our youngest daughter, Melody had an ultrasound today and they were able to detect the heartbeat! She started feeling pretty sick about the middle of September and suspected she might be pregnant. Her first appointment was 2 weeks ago but there wasn't a heartbeat so she had to come back today. Isn't it great to be able to peak in on a brand new life. Ummm, life is SO good! 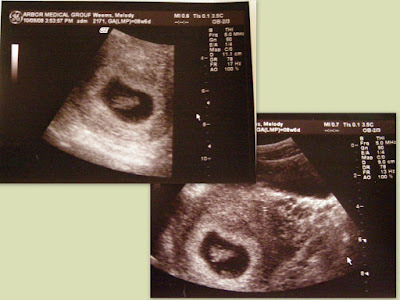 She is approximately 7 weeks and 5 days pregnant and her due date is May 23rd of next year.